Emily Pendleton, while gathering berries in the woods one day, overhears a plot to kill her neighbor, the Viscount Lindemann. Sensing that she has been discovered, she begins running away, only to run directly into the path of the viscount. After she mistakenly attacks him (I won't tell you how), thinking he is one of her pursuers; he soon recovers and begins to wonder about his 'protector'. Gabriel, Viscount Lindemann, has recently returned from the war, and is hosting an unwanted houseparty arranged by his cousin Cecil. He visits Emily at her home, becomes entranced by her, and invites her to his houseparty, telling her that she can help him discover who wishes him dead, and later proceeds to fall in love with her. When they are caught in a compromising position by Cecil, Gabriel announces he and Emily are engaged and realizes this is the very thing he wants. However, now the men who want him dead are including Emily along with the viscount, and he knows he must protect her as well as himself, all the while trying to convince her that she is imagining things. He does this because he wants her to not put herself in danger; but Emily is braver than he thinks, and continues her investigation regardless of what the viscount wants. I do like Regency romances, and this one had potential. However, even after Emily believes that Gabriel would not want her for a wife, she never tried to change her ways at all. 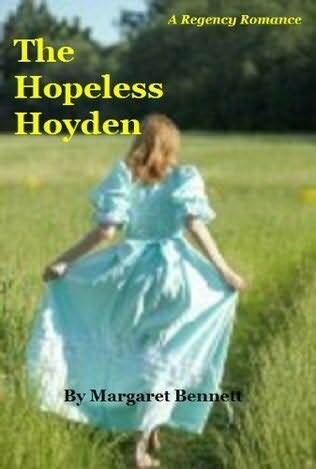 She not only continued being a 'hoyden', as it were, but continued putting herself in situations to prove that she was one. That didn't make any sense to me. Also, there were quite a few typographical errors which detracted from the story: bread instead of beard; wrecked instead of wracked; stain instead of satin; coach instead of couch; gong instead of going; petty coat instead of petticoat (which was used several times, and would be proper if you thought perhaps your coat was of small importance). Perhaps if there were not so many errors which detracted from the book, I would have given it another star. However, it is a sweet light read, and recommended for anyone who likes Regencies. Alexander Greystone is a professor of medieval studies and a bachelor in Victorian London. He is also a writer, but has a case of writer's block. So he decides to take a vacation in the country, accompanied by his motherly housekeeper, Miss Farnsworth. He has rented a cottage in Hampshire which carries a secret. But Alexander has a secret of his own - he can communicate with the dead. After finding an unusual painting the attic, Alexander is told by the owner of the cottage that the subject of the painting, the seven Hawthorne sisters, emigrated to America. But with Alexander's ability, and his acute deductive reasoning, he believes otherwise. 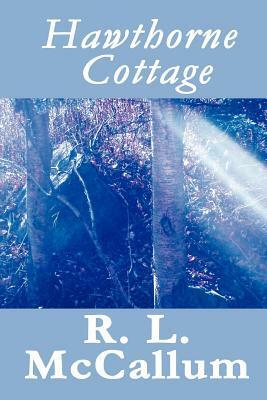 And when strange things begin happening, he finds out that his cottage is haunted, and he proceeds to find out why. The cottage is haunted and the book is haunting. It is one that will stay with you long after reading it. I found Alexander to be a tragic character; he not only communicates with the dead, there is also something tragic with his relationships with females (which you will have to read the book to find out, and which I wish the author would have expanded upon more). He is a shuttered person; he does not allow anyone to get too close to him, and understandably so. He is very intelligent and also very inquisitive; which is why he begins to investigate what really happened to the Hawthorne girls. For you see, he is sure that they never left the cottage. And what he finds out, and why - it is heartwrenching, terrible, and sad. 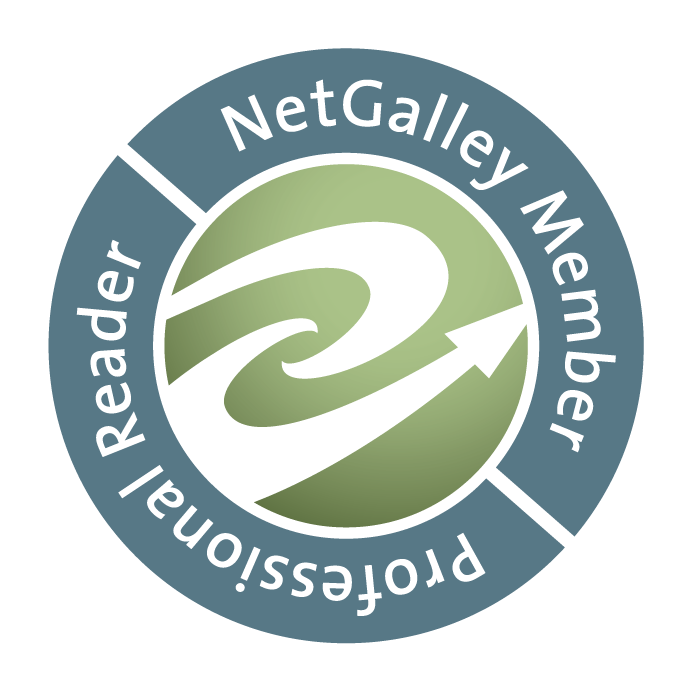 It pulls at the reader and makes one remember long after the book is finished. This is a well-written book, and has a protagonist that draws you into his life, but also into the lives of the tragic Hawthorne girls; and you feel for them, feel their hurt and fright and tragedy. I highly recommend this book and sincerely hope that Mr. McCallum continues with Alexander's adventures. Darla King is an ex-criminal investigator for the Florida State Attorney's Office turned square dance caller. She changed careers because her husband was killed in the line of duty and she wanted to move out of state. She now lives in a small town in Texas, and travels throughout the state calling dances. Her life, however, gets complicated when a man turns up unconcious at a friend's ranch, and federal agents are at the home. Suspecting more than meets the eye, Darla, along with her friends Doug, Sam, and Carlotta, decide that a mystery is near and attempt to find out who attacked the man and why. 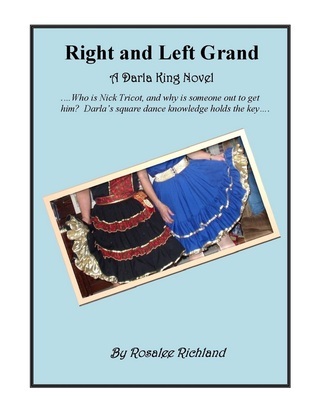 The man, Nick, turns out to also be a square dancer, and he joins Darla's group of friends as a partner to Carlotta, who becomes interested in him. Not wanting to see her friend hurt, Darla is resolved to find out exactly what Nick knows about the men who attacked him. I received a copy of this book from the author in return for an honest review. Since my own father was a square dancer in Texas, and I watched him several times, I felt that I knew a little bit about it and would be interested in reading more. Well, that's exactly what I knew: a little bit. This book, unfortunately, reads like a square dance manual. Quite a bit of the action is centered around square dancing, and the author proceeds to explain every single thing she can about it - repeatedly. Every single time there is a dance, the reader hears about every single move the dancer makes. That would be fine if you were interested in square dancing; but if you're not, you probably won't be interested in this book. Also, when the typical reader sees that the book is a mystery, it is naturally assumed - maybe wrongly, but still assumed - that it is a murder mystery. This book is not. It is not even a 'thriller'. In the category Mystery, Crime and Thriller, it would be listed under crime. And the crime itself is rarely spoken of. Most of the time Darla is trying to find out what Nick has to do with the crime committed, and she doesn't even know what that crime is. Darla, meanwhile, lives and breathes square dancing. Example: She goes to her daughter's apartment for Thanksgiving, and brings her square dancing CDs and equipment with her because a 'good caller will be prepared on a moment's notice.' I ask you, who, on Thanksgiving Day is going to decide they want to go square dance and need to find a caller? I would think most people would want to be with their families that day, and if perchance there were a dance scheduled they would already have a caller in place. I think it was carried overboard somewhat. It is like this - many books are written along the lines of the protagonist's career, but here is the difference: If you were reading a book about a baker who specialized in cakes, and she told you every few pages that she was making another cake and listed every single ingredient every single time, I think you would probably tire of reading about cakes very quickly. Most people don't want to hear that 'she added 2 eggs, 1 cup of milk,' etc., over and over. The book itself was written well, and I would suggest to the author that in her follow up book (of which was stated at the end of this one), that she concentrate less on the square dance calling and more on the mystery. Otherwise, she has boxed herself in to only one type of reader - that of the square dancer. Charlotte Bessette, along with her cousin Matthew, are new proprietors of the Fromagerie Bessette (commonly known as The Cheese Shop) in Providence, Ohio. They were given the shop by their French grandparents after the grandparents retired. One night, during a cheese and wine tasting, someone is murdered right outside the shop, stabbed with one of Charlotte's prized olive-handled knives. Standing over the body is Charlotte's grandmother, who has blood on her hands. Now it's up to Charlotte to find the killer before her grandmother is put on trial for the crime. 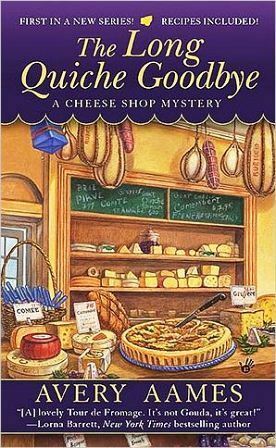 A decent mystery, but: It is about a cheese shop owner - who doesn't make cheese. She gets all of her cheese from other places, and sells it. Okay. To me, that is like going to a bakery to buy cinnamon rolls and finding out they get them from Cinnabon. When I buy cheese from a specialty shop, I want to know they made the cheese. If not, I order directly online. It wouldn't be so bad if she at least labeled the cheese from where it is made, (all local places) but she doesn't. And she has an awful lot of it. So much so, that all anyone eats is cheese or things made with cheese. People have 'events' and cater cheese. Really? She even makes a chicken and cheese 'sandwich' for her grandmother that consists of chicken, cheese and a cracker. But she calls it a sandwich. I'd call it chicken on crackers. (I was really surprised when her grandfather did barbeque and it wasn't cheese). It makes me wonder if these people have "bathroom problems," they eat so much of it. They have cheese dishes for breakfast, lunch and dinner. This poor family. Why is it when a book like this is written everyone feels the need to eat only the product they sell? Loyalty to your product is one thing, insanity is something else. And every business in town buys only the best - things imported from other countries. Nobody buys anything made in America, from what I can tell. There is also supposed to be a maybe-romance there, but it didn't seem to draw me in at all. Charlotte and Jordan just don't seem to have a spark together, not in their banter, anyway. Nothing to keep me interested in any developments in that corner. There's even a scene where a restaurant runs out of cheese (I guess they don't do inventory at the restaurant), and they ask Charlotte to send over ten pounds of cheese. (I guess no one has figured out where she buys her cheese and gets it there). They'd rather buy it from her and pay the markup price instead of dealing directly with the vendor. Very odd indeed. 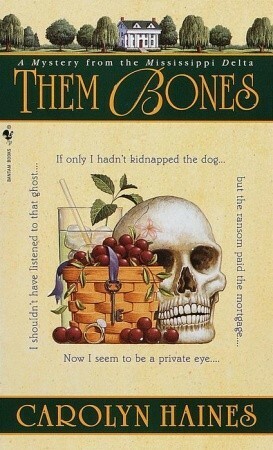 This is the first book in the "Supper Club" mysteries. Professor James Henry used to teach at William and Mary, but has returned home to care for his recently widowed father. It doesn't help that "Puff" as he is known, is divorced, overweight and shy. He wants more out of life, but he realizes that in order to do so, he must lose weight. So, he joins a group that call themselves "The Flab Five". They figure with each other's help, they all will be able to reach their weight goals. While driving home one night, the professor comes across the dead body of a local girl. He and his new friends set out to solve the murder, putting themselves in danger. I really liked this book, and the author knows how to write. I enjoyed the characters, and hope that there is more development to them as the series progresses. However, the one thing that bothered me is one of the characters, Gillian, is a dog groomer. This is fine, except at one point in the book she states that she is going to have a busy day because she has to "declaw a cat". Excuse me, but groomers do not declaw cats. Only vets do that. The author needs to figure out what a dog groomer can and cannot do. So, I will read the second in the series and we will see if this 'groomer' still thinks she's a vet. Josie Toadfern owns a laundromat in a small town. Since being ostracized from her father's family. When she was two years old, her father left and her mother shortly thereafter put her in an orphanage. Her paternal grandmother told everyone she was dead, and she was raised by her maternal aunt and uncle, who rescued her. Now, twenty-two years later, her grandmother, 'Mamaw' Toadfern sends Josie a message that she wants to see her, and that is why is is going to spend Thanksgiving dinner with her paternal side of the family. Josie doesn't want to go, and against her better judgment, she does because she is curious and wants to see why she was invited. That is when things go from bad to worse. Shortly after she arrives, her mother shows up - as does her father. When there is a murder, her father is accused of the crime, so Josie sets out to prove him innocent. 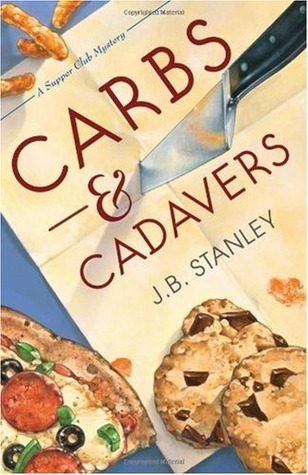 I read this book because it takes place at Thanksgiving (and I usually read holiday-themed books in the autumn and winter); and was pleasantly surprised to find that it was a good mystery. I read this book because it takes place at Thanksgiving (I read usually read holiday-themed books around the autumn and winter holidays), and was pleasantly surprised to find it a good mystery. Even though I liked this book, I still had to wonder: After what her parents did - dumping her in an orphanage like she didn't exist - did she even care what happened to them? They didn't appear to love her, because they didn't even try to find a family member to raise her. I guess blood IS thicker than water. Still, recommended reading. Sarah Booth Delany has returned to her home in Zinnia, Mississippi. After a failed career in New York, she returns to her ancestral home, Dahlia House, over thirty, unemployed and unwed. Also living at Dahlia House is Jitty, a her great-great-grandmother's nanny - and a ghost who is now haunting Sarah Booth. 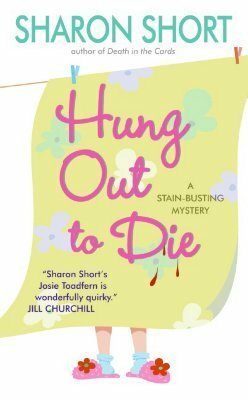 On the verge of losing her home and desperate for money, Jitty convinces Sarah Booth to kidnap Chablis, the dog of her best friend, Tinkie. She sends Tinkie a ransom note for $5000, and Tinkie, frantic, wants Sarah Booth to deliver the money and retrieve her dog. What this does, is unleash an entire series of events regarding a 20-year-old murder case that leads to questions nobody wants asked and threats on Sarah Booth's life. But she presses on, because by now she is immersed in the case and has some questions of her own. It doesn't help that she's attracted to the murder victim's son, who has been living abroad since the murder, and has now returned home and wants nothing more than for her to drop the whole thing. Sarah Booth is a 'Daddy's Girl', whose only job is to marry well and enjoy the privileges that come with it. But she is not like the others of her ilk, she is unconventional and not interested in marrying the first man who asks her that is rich. She returns home to Zinnia Mississippi, still unwed and now unemployed, and about to lose her ancestral home, Dahlia House. Desperate for money, she listens to Jitty, who convinces her that the quickest way to get it is to kidnap Chablis, her best friend Tinkie's dog, and then ransom him back. Having done this, Tinkie declares that Sarah Booth is now a PI, and hires her to find out why an ex-boyfriend, Hamilton Garrett V, has recently returned home. Years ago, Hamilton was exiled to Europe when first his father, then mother were killed. There are reasons he was sent to Europe, and after setting sight on Hamilton, and immediately being drawn to him, she ultimately decides that the deep mystery surrounding his family and the reason he was sent to Europe are something she must find out. She first convinces herself it is for her friend Tinkie, but soon realizes she is doing it for herself. While she is investigating Hamilton, she also begins investigating the two murders (under the guise of writing a fictional book), since she believes that Tinkie deserves to know the truth about the situation. Sarah Booth begins discovering secrets, and soon finds out what everyone really wants her to do is just leave it all alone and forget the past - which she is not about to do. This book moved along at a great pace, Sarah Booth is headstrong, her conversations with Jitty are interesting, to say the least, and the descriptions of the area where she lives are colorful. What I really found the most interesting were the women. The way the women interacted with each other was extremely telling in how the Daddy's Girls were different, and of a different class. Sarah Booth was somewhere in the middle, now disdained by the true Daddy's Girls, but still one of them, and as such, those that weren't kept her at arm's length. 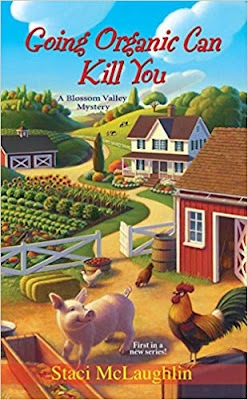 This book was delightful, the mystery well done, the characters described wonderfully. I highly recommend this and can't wait to read the next in the series.